If you think that soufflés are too complicated to make, please don’t close this page yet. Read further! I mean it. 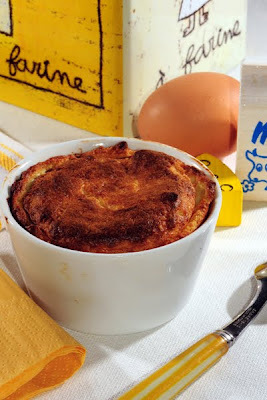 Back to my soufflés….I have started serving them to my children after I introduced eggs in their diet (after their first birthday). It’s a success every time I make some: they like it, they ask for more and if I could reheat it (you can’t) and put it in my daughter’s lunch box the next day, she would be thrilled! I have worked with many recipes but I can’t get to making a soufflé for four people with 6 eggs, cheese, milk, and butter. That’s too many calories at once (and too much cholesterol for me who come from a family with a lot of bad cholesterol). My recipe only calls for 3 eggs and it has been working for us so far. The key thing with any soufflé is that you have to serve it the minute you get it out of the oven. As we say in France “don’t plan on serving a soufflé if you have guests over… because you never know if they are going to be on time or not”.... (or, in my case, if takes you 10 minutes to get a correct picture!) That’s the only difficulty. Trust me. So, please, give it a try! Bon Appétit! In a pot over medium-heat, melt the butter. Once bubbling, add the flour and stir. Add the milk and stir until the sauce thickens. Add salt, pepper (and nutmeg) to taste. Out of the stove, add the 3 yolks to the sauce and stir. Add the Swiss cheese and stir until the cheese is melted. With a beater, beat the egg whites with a pinch of salt, until they are firm. Slowly stir them in the soufflé batter. Butter the soufflé dish and pour the batter in. Take a knife and circle it around the batter inside the dish. That will help the soufflé rise. Bake in the oven for 40 minutes without opening the door! Cooking time will depend on your oven. If you cook individual soufflés, they'll cook faster. I like soufflés... when other people make them ;-) ! Oh, how we love cheese! I can't wait to try this. Thank you for the fun Saturday project. Ooh, I did always think souffles were too complicated, but now I'm inspired to try one. I just need a dish to bake it in!